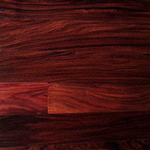 Bolivian Rosewood (or Morado) is distributed throughout Bolivian Brazil and Central and South America. Morado is 79% harder than Hickory, 22% harder than hard Maple, 36% harder than Red Oak, and 8% harder than Wenge. Clear grade Morado flooring is color-sorted for a rich brown color with pronounced brown and black grain. It is not a true rosewood, but it is the next best thing. Most rosewoods are endangered and not available in flooring. There are other species that are called Bolivian Rosewood, but Morado is rare in itself and not to be confused with imitators that are in no way similar. The only other grade of Morado available is Rustic or Eco grade Morado, which contains wild color variation with its white sapwood, similar to that of Rustic Hickory, but with deeper color. All Morado flooring is milled in South America because it is more cost-effective to ship finished material than raw lumber. Lengths of the Morado flooring bundles are 7 feet so they can easily fit into 8-foot-wide steel shipping containers. All pre-milled products are tongue-&-groove and end-matched (tongue-&-grooved on the ends of the boards). Moisture content ranges from 6% to 8% for quick acclimation. The average length of the flooring pieces is usually about 3 feet and ranges from 1 to 7 feet. Almost all imported flooring that is found is in 7-foot bundles, with widths available from 2¼″ to 5″. Typically, if a long or wide plank floor is desired, raw lumber must be obtained and the flooring must be milled here in the United States. Typically, the lengths can develop up to 12 feet. However, the cost can be double that of the pre-milled stock because of waste and labor costs in the United States. Also, raw lumber is relatively expensive because it is taxed more heavily than finished products to support local economies in South America. Morado lumber is extremely rare causing the flooring price to multiply exponentially. Morado is available almost exclusively unfinished ¾″ solid form. It can be prefinished or engineered by custom order. Morado is extremely rare in comparison with many Brazilian species such as Brazilian Cherry. There is a limited amount of Morado in South America, but it is not endangered. Less logging, stricter regulations, and a slower American economy have limited commodities and caused slightly higher prices of this product in this country, but it is still available. A Clear grade floor will have a busy, overall brown appearance. Morado flooring darkens some with sunlight but is dark unfinished. Oil-based finishes allow Morado to age to a deeper brown color; however, lacquer or de-waxed shellac should be first applied to help to aid in drying because of the oily nature of the wood. Water-based finishes will preserve the natural color longer but can appear milky in appearance because of the darkness of the wood. Morado flooring is extremely durable and resists denting and traffic wear quite well. It is much harder than North American species because of its density and is relatively stable. Morado flooring is very heavy, weighing over 3 pounds per square foot. Although extremely hard and tough, Morado works with little difficulty with both hand and power tools. When installing the Morado flooring, it is best to use a manual nailer, but staples and pneumatic nailers can be used. It holds screws well, and it glues, stains, and polishes to a very attractive finish. It can be somewhat difficult to sand with flooring equipment because of its hardness. Professional sanding and finishing is recommended. This wood is very resistant to decay and insects; these resistant properties may contribute to a possible allergic response to the dust. To avoid a possible allergic reaction to the material, wear a dust mask and long-sleeve shirt when working with Morado. Morado flooring is used in high-end residential and commercial applications for a dramatically elegant floor. It works well in rustic camps as well as in contemporary structures. There is no other floor that is similar.